The Feldenkrais Method is an educational system that uses movement to teach self awareness and improve function. The Feldenkrais Method was developed by Dr. Moshe Feldenkrais (1904-1984). The Biography of Dr. Feldenkrais shows his diverse fields of study and hints to the sources of the genius of the Method he developed. Dr. Moshe Feldenkrais wrote extensively. Here are some excerpts of his works that will stimulate your thinking, and serve as an introduction to the Feldenkrais Method. The IFF has adopted Standards of Practice, which give a description of the applications of the method. 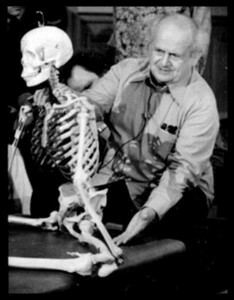 Examples of Dr. Feldenkrais teaching can be viewed or listened to in our online Archive. The way the mind and body are united has preoccupied human beings throughout the centuries. ‘A healthy mind in a healthy body’ and similar sayings show a conception of one kind of unity. I believe that the unity of mind and body is an objective reality. They are not just parts somehow related to each other, but an inseparable whole while functioning. A brain without a body could not think; at least, the continuing of mental functions is assured by corresponding motor functions. There is little doubt in my mind that the motor function, and perhaps the muscles themselves, are part and parcel of our higher functions. This is not true only of those higher functions like singing, painting and loving, which are impossible without muscular activity, but also of thinking, recalling, remembering and feeling. The advantage of approaching the unity of mental and muscular life through the body lies in the fact that the muscle expression is simpler because it is concrete and easier to locate. It is also incomparably easier to make a person aware of what is happening in the body, therefore the body approach yields faster and more direct results. On acting on the significant parts of the body, such as the eyes, the neck, the breath, or the pelvis, it is easy to effect striking changes of mood on the spot. A person is made up of three entities: the nervous system, which is the core; the body – skeleton, viscera and muscles; and the environment, which is space, gravitation, and society. These three aspects, each with its material support and its activity, together give a working picture of a human being. Individually acquired action (ontogenic action) pertains to the senses. Such action can be altered or learned as one can become aware of the actual differences, such as the extent of the effort, its coordination in time, the body sensation, the spatial configuration of the body segments, the standing, the breathing, the wording, etc. This kind of awared learning is complete when the new mode of action becomes automatic or even unconscious, as all habits do. The advantage of a habit acquired by awareness is that when it shows unfitness or maladjustment when confronted with reality, it easily provokes new awareness and so helps one to make a fresh and more efficient change. The manipulative technique is necessarily individual and custom tailored to fit the particular needs of the person. I begin with the person lying on his or her back. This position is meant to reduce most of the influence of gravity on the body, freeing the nervous system. The reaction of the nervous system to the pull of gravity is a habit, and under these circumstances, there is no way to bring the muscles to respond differently to the same stimulus, which is the major means of reeducating the body. In due course I teach people by using [up to] thirty different body situations, going to sitting, standing, walking and balancing on […] rollers. Functional Integration is essentially nonverbal. It is effective because the injured person […] has lost the ability to help himself. Their self-reliance is so compromised that most treatment produces only superficial improvement, if any at all. (In Functional Integration)… the deepest kinesthetic sensations formed in early childhood are affected. The person withdraws from what happens in the outside world and is completely absorbed with attending to the internally occurring changes. The smoother eye movement, the rotation of the head, the change in pressure distribution on the soles of the feet, the reduction of intercostal tensions, the completion of the antigravitational muscular patterns for a clear feeling of vertical upright standing cannot occur without a complete change of neural functioning of the intentional or motor cortex and of the sensory one. For example, a particular group I have taught consisted of men and women suffering from sciatica, discal hernias, frozen shoulder and similar complaints. Other groups may be composed of teachers, actors, singers, dancers, etc. I begin by asking people to lie on their backs (after the same principle of reducing gravity) and learn to scan themselves. That is, they examine attentively the contact of their bodies with the floor and gradually learn to detect considerable differences – points where the contact is feeble or non-existent and others where it is full and distinct. This training develops awareness of the location of muscles producing weak contact through permanent excessive tension, thus holding parts of the body up off the floor. Some improvement in tension reduction can be achieved through muscular awareness alone, but beyond that no improvement will be carried over into normal live unless people increase their awareness of the skeleton and its orientation. I usually make clear that the point of my work is to lead to awareness in action, or the ability to make contact with one’s own skeleton and muscles and with the environment practically simultaneously. This is not ‘relaxation’, for true relaxation can be maintained only when doing nothing. The aim is not complete relaxation but healthy, powerful, easy and pleasurable exertion. The reduction of tension is necessary because efficient movement should be effortless. Inefficiency is sensed as effort and prevents doing more and better. The gradual reduction of useless effort is necessary in order to increase kinesthetic sensitivity, without which a person cannot become self regulating. Another important feature of the group work is the continued novelty of situation that is maintained throughout the course. Once the novelty wears off, awareness is dulled and no learning takes place. If a configuration needs repetition, I teach it in tens and even hundreds of variations until they are mastered. All exercises are arranged to produce a neat change in sensation at the end of the lesson and usually a more or less lasting effect. This enables pupils to find connections between different parts of the body, as for instance between the left shoulder blade and the right hip joint, or between the eye muscle and the toes. To produce the mental ease necessary for the reduction of useless efforts, the group is repeatedly encouraged to learn to do a little less well than is possible when trying hard to be less fast, less vigorous, less graceful, etc. They are often asked to do the utmost and then deliberately to do a little less. This is more important than it might seem. For if enabled to feel progress while not tensing, pupils have the sensation of being able to do better, which induces more progress. Achievements that otherwise need numerous hours of work can be obtained in twenty minutes with this attitude of mind and body. Special mention must be made of very small, barely perceptible movements that I use extensively. They reduce involuntary contraction in the muscles in an astonishing way; in a few minutes by working on one leg or arm, for example, it may be made to feel longer and lighter than the other. But whatever the exercise or the principle used, the lesson is so arranged that without concentration, without trying to sense differences, without real attention, pupils cannot proceed to the next stage. Repetition, just mechanical repetition without attention, is discouraged, made impossible in fact. Many exercises consist in attending to the means of achieving a goal and not to the goal itself, which is an important way of reducing tension. All these exercises aim at achieving mental and physical cooordination and in particular good erect posture and correct action. Finally, self-knowledge through awareness is the goal of reeducation. As we become aware of what we are doing in fact, and not what we say or think we are doing, the way to improvement is wide open to us.